Description: Cankers are sunken areas of dead tissue or splits in the bark or epidermis of branches, stems, or trunks of woody plants. They’re primarily caused by pathogenic fungi or bacteria and by physical injuries. 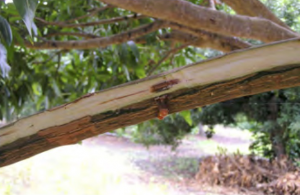 Symptoms and Damage: Branch dieback in the upper/outer canopy is often the first noticeable symptom of a canker disease. Foliage on affected branches wilts and turns brown or black. Bark develops sunken areas, with a sharp margin between healthy and diseased tissue, sometimes associated with stem bleeding (oozing sap). Often, but not always, sapwood will show staining as seen in the photo below. 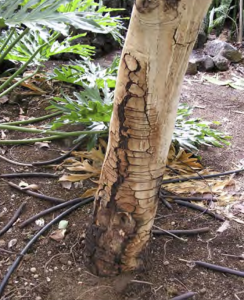 Stems, branches, or entire trees can become girdled or die as bark death progresses. • Plant landscape species that are adapted to the local environment in well-drained soils. • Keep sprinkler irrigation off plant stems. Avoid over-irrigation, and move drip irrigation emitters progressively father from plant stems over time. • For safety, prune away dead or dying branches, as they may dislodge and fall. Make pruning cuts within the healthy wood, away from the diseased wood. Remove and destroy dead or dying trees or pruned branches. • Maintain optimum plant vigor by using recommended practices for nutrition, pruning, and irrigation for each tree or plant species. Moderate applications of slow-release fertilizers may improve the health of infected plants; avoid over-fertilization. 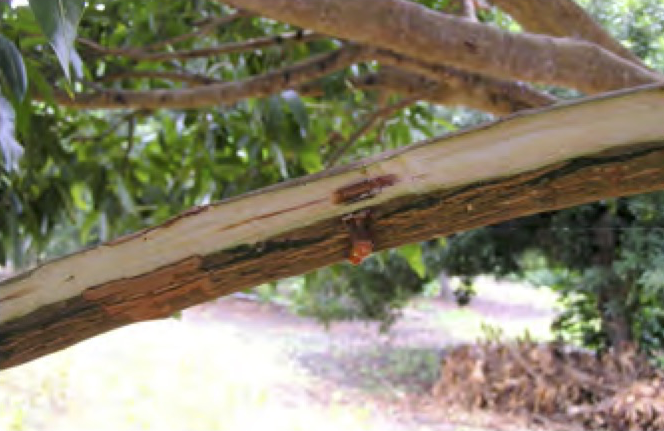 • Avoid transmitting canker pathogens between plants on pruning shears.